The Welshpool-based company can be found on Stand 349 in Hall 4 at SPS IPC Drives 2017 which this year focuses on digital transformation. Products on display will include the general purpose Optidrive E3, Optidrive P2 high performance AC drive, Optidrive Eco used for fan and pump applications, and the new P2 Solar Pump Drive. After being first unveiled at Hannover Messe earlier in 2017, the company’s new series of Industry 4.0 enabling technologies for drive commissioning, monitoring and communication will also be on display. The new Optitools Mobile drive commissioning and monitoring app is supported with the introduction of the new Optistick Smart communication module which takes full advantage of the latest mobile, cloud-based and contactless technologies. Optitools Mobile is an app for Android and IOS handheld devices that delivers the powerful drive commissioning, programming and parameter back up capabilities previously only available in the established Optitools Studio PC version of this software. The app allows real time monitoring of the drive together with parameter editing and parameter storage. And this all works seamlessly across the complete family of Optidrive variable frequency drives. Optistick Smart is the new generation of parameter copying tool, introduced to compliment the benefits of Optitools Mobile and extend flexible communication with any Optidrive variable frequency drive. Optistick Smart can be used to create a Bluetooth enabled Optidrive VFD simply by plugging the Optistick Smart into the front of the drive. The latest Bluetooth technology on-board the Optistick Smart then enables real time monitoring of the drive straight from your mobile, laptop or Bluetooth enabled PC, with no wires. Sales and Marketing Director, Rhydian Welson, explains: “SPS plays a vital role in our global marketing activities as it attracts visitors in the automation industry from around the world, providing an ideal opportunity for us to showcase our products and innovations on a global scale. “Industry 4.0 enabling technologies are going to play a major role in the future for all applications and, with SPS having a special area dedicated to this digital transformation, I am delighted that we too can showcase our own innovations in this area. “It’s such a huge exhibition that exhibitors have to work really hard to make sure they stand out. We know that being in Hall 4 provides us with an excellent location where our stand will really be seen and we are hoping to deliver a really successful show and hope our Industry 4.0 technologies will also provide another reason to visit us. “All of our products will be on display because visitors to this show come from many of the different sectors we work in such as pump, HVAC building services, elevators, general automation and marine. “At the show we will be able to tell these visitors more about how our products can benefit their own companies by reducing costs as well as cutting the impact their operations have on the environment,” he added. 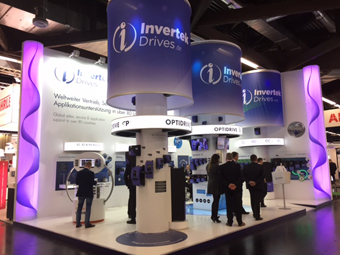 SPS IPC Drives 2016 attracted 1,605 exhibitors and 63,291 visitors - 47,939 visitors (75.7%) from Germany and 15.352 visitors (24.3%) from other countries and the picture top shows our stand at last year's event. Taking place in Nuremberg from 28-30 November, SPS organisers are expecting a record number of visitors to attend the show to discover the latest innovations in industrial automation. Find out more about SPS IPC Drives 2017 here.